Tom Raffield’s first pop-up shop at 67 York Street, Marylebone, will celebrate the launch of its New Collection 17/18 of furniture and lighting this September. Coinciding with London Design Festival, the space will showcase exciting new handcrafted, steam-bent pieces for which the Cornish-based design studio has become renowned. Products from its first collaboration with artisan textile design studio A Rum Fellow will also be available to view. Drop in between 16-23 September 10am-6pm, or contract/trade can make a preview appointment between 11-15 September at 67a York Street, London, W1H 1QB. T: 01326 722725. Please contact sarah@tomraffield.com for more information. With an experimental workshop set amongst six acres of ancient woodland in Cornwall, Tom Raffield designs are synonymous with nature; created as sculptural pieces inspired by the natural environment that surrounds the studio. Each product is handcrafted by a pioneering form of steam bending to create Tom Raffield’s uniquely bold and contemporary products ranging from lighting to furniture. The latest collection continues this signature aesthetic, incorporating steam-bent elements into a range of solid, sustainably sourced oak furniture. 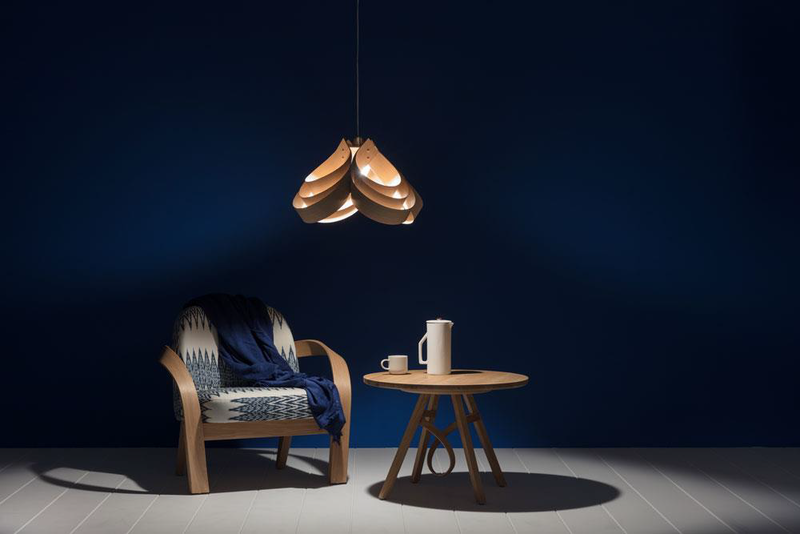 Stand outs include the Mooring Table Light featuring a graceful steam bent oak stem and coloured flex which wraps itself around the base, the Twill Coat Stand made of five steam bent arms, and a new statement-sized Harlyn Mirror whose hanging loop has been designed to playfully resemble a twisted leather strap. Each piece of Tom Raffield furniture and lighting is inspired by nature and shaped by hand-his woodland workshop provides a fitting backdrop for a team of skilled craftsmen trained by Tom. “Each piece we create has been on an experimental journey-individual, organic and carefully considered. We source everything from sustainable forests, coupled with the low energy steam bending process, it is very ecological with little wastage,” explains Tom Raffield, designer and maker.